What did you learn from each of your previous bosses? Maybe you worked for one of those rare “natural” supervisors or managers. I’ve met a few, but they are few and far between. Most of us who have worked inside organizations have worked for a series of bosses. And we probably had no difficulty finding things about their style that bugged us, frustrated us, even made us angry from time to time. But at the same time, looking at it from the rear view mirror, I bet you also learned some valuable lessons from each of them. I know I did. Some of those lessons were positives – things to emulate, copy, and modify to fit me. And some were negatives – things to not do when faced with a similar situation. One of my first bosses was The Chief. He was a Master Chief Petty Officer in the U.S. Navy and was the lead admin for the Supply Officer on my ship. He’d been in the Navy about 25 years and had risen steadily to become one of the senior people in his logistics specialty. Since our ship had one of the first on-board computers in the Navy (a Univac 1500 that took up a lot of room and was one of the few air-conditioned spaces on the ship), we were dealing with state-of-the art in some ways, and very old technology in others. Remember 10-part carbon paperwork? From The Chief I learned precision and the importance of doing the job to the best of my ability. He also served as a role model of how to handle a difficult boss who had spent his entire career on shore duty. When we were at sea, the Supply Officer spent the whole time holed up in his cabin, alternately hollering at somebody over the ship’s phone and bouts of throwing up . Some years later I worked for a boss I’ll call Sam. I was running an organization-wide system with multiple locations and nearly round-the-clock operations. From Sam I learned the value of building effective cross-departmental relationships and the wisdom of seeking multiple opinions and perspectives before making major decisions. My mid-20’s shoot-from-the-hip, get-it-done-now style sometimes backfired on me, particularly when I failed to identify key stakeholders and give them a “heads-up” regarding plans. Sam showed us all how to lead a diverse (and often highly competative) group of department heads in a positive direction by “communicating lavishly,” to use a favorite Max DePree quote. Sam knew where we were heading, kept us all in the loop, and ran interference with other senior leaders when necessary. Quiet leadership, practiced daily. Those are just two of the people I learned from. What did you learn? Think about what you’ve learned from some of the people you’ve worked for over the years. If you’d like to share a thought or two, that would be great. If not, at least think about it. The initial session (of 10) of the ONEplace Nonprofit Leadership Academy (ONLA) got underway on January 20th, with twenty of Kalamazoo County’s best and brightest nonprofit managers. After welcoming comments from KPL Director of Libraries Ann Rohrbaugh, an overview of the Academy syllabus and expectations, the participants received the results of their 360-degree feedback process. We used a great tool called the Mangement-Leadership Practices Inventory to gather feedback from their manager, their employees, and their peers. Honest feedback is often hard to come by for most managers. When we manage a team or a department in a larger nonprofit the person we report to may not have much opportunity see how you work with your employees and may have limited chances to see how you interact with your peers. For day-to-day, get-the-job-done managing, your employees will have a much better perspective on what kind of job you are doing at that level. And in most organizations, employees have very little chance to provide feedback anonymously. That’s where a tool like the MLPI can provide supervisors and managers with feedback you can use right now to help you grow, develop, and improve as a manager and leader. As you would expect, the ONLA group’s scores were generally above average on the MLPI Factors. And yet, in most cases, a bit of digging into the data (and there is lots of data!) reveals some surprises, some “ah-ha’s” and some good ideas about what to work on right now. I’m sure the ONLA folks wished they didn’t have to sit through my briefing on what the instrument measures, how it works, and how to understand the data. But I know from past experience that without that briefing, the wealth of data can be a bit daunting. After nearly an hour to work with their data and start to build the framework of their professional action plan for 2012, it was time to hand off to Janice Maatman, Director of WMU’s award-winning Nonprofit Education Program . She lead a great session on Ethics that got everyone thinking and discussing ethical issues with a nonprofit focus. With reading assignments and a discussion with their mentor ONLA participants are going to be busy folks between now and their next session on February 3rd. This is going to be a great Academy, there is no doubt about it. Stay tuned. For the past six months I’ve been collaborating with the great folks at ONEplace@KPL in Kalamazoo (see “Building Nonprofit Capacity” for more on ONEplace) on creating the ONEplace Nonprofit Leadership Academy (ONLA). The first group of 20 high-potential nonprofit managers begins their journey tomorrow morning, and I confess to being pretty darn excited! Thanks to Bobbe Luce (founder and ED at ONEplace) Kalamazoo County nonprofits will have a ready-to-lead group of future executive directors. Bobbe’s research shows that a majority of the EDs of larger nonprofits are above the age of 50, and many are within less than 5 years of retirement. This means there will be lots of turnover at the top of these organizations. This is not an issue just for our local nonprofits, but a national issue that needs attention. Many of the current EDs are also the founders of these larger nonprofits, and grooming leaders to follow in those footsteps is just not being done. And in many cases little or no succession planning has been done by nonprofit boards. Thus, ONLA is born. Tomorrow the group will receive the results of a 360-degree feedback survey of their Employees, Peers, and Manager. For many this will be the first time they’ve received this kind of feedback, and the buzz within the group is pretty high. This is going to be a great series of experiences for these 20 future EDs. Stay tuned! 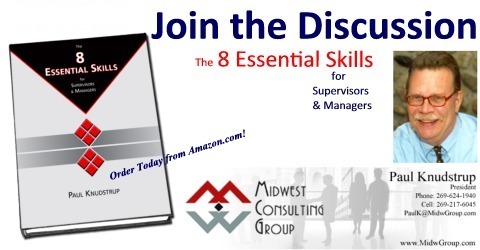 This week we’re getting the word out that The 8 Essential Skills for Supervisors & Managers is published and now available on Amazon.com. We’ve sent out E-mail announcements letting our contacts know the book is, at long last, actually out and available. Regular readers of this blog know this has been a longer process than originally planned, but in the high-change world we live in today, no major project is likely to go exactly as originally planned. After all, Skill 5 of The 8 Essential Skills is Managing Change. How are you doing with managing change in your life? Skill 5 – Managing Change: a 500 mile auto race with 33 cars on the grid at the start is a study in Change. Often rapid and abrupt change. And it can (and does) happen at any point in the race. Davy Hamilton returned to the Indy 500 after a nine year hiatus, only to crash on the first lap after Thomas Scheckter took Hamilton’s line in Turn 2, causing Hamilton to swerve, lose control, and hit the inner wall. Sarah Fisher, on the other hand, steadily worked her way up in the field over much of the race only to graze the wall on lap 125, ending her day. Often the 500 is lost or won in the pits and when a driver is given the “Go!” signal before the fuel hose is fully disconnected, a return to the pit on the next lap causes a delay and may affect that drivers finishing order. Constant change is the norm; how it gets handled and what adjustments get made makes all the difference. Almost everyone agrees that the pace, degree, and effects of change on our daily lives is increasing. And many of us don’t like it! Whether the amount, rate, and scope of change is accelerating in your own life or not, we all live and work in an environment where change is pretty much a constant. In fact, many assert that change is the only constant in daily life. You can definitely count on things being different in the future than they are today. What do you think? Of the 8 Essential Skills this one – Managing Change seems to be more and more of a challenge all the time. How do you keep your sanity in this rapidly-changing world? What techniques have you developed for helping your team be more effective and successful as the waves of change come at you?